DONETSK, Ukraine -- Pro-Russian separatists have intensified shelling of government forces on all front lines and appear to be amassing forces for new offensives on the key railway town of Debaltseve and the coastal city of Mariupol, Ukraine's military said on Saturday. 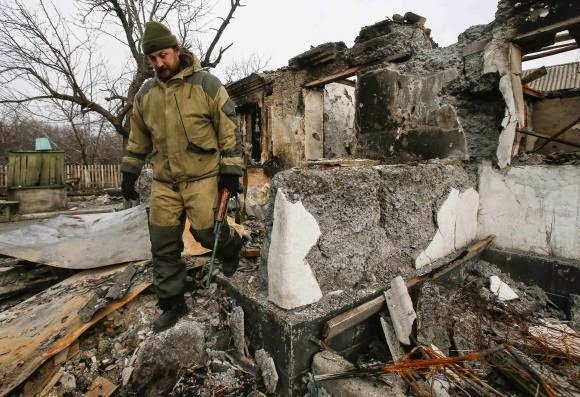 A member of a rebel unit of the self-proclaimed separatist Donetsk People's Republic walks past a house destroyed by shelling in the village of Olenivka, south of Donetsk, February 7, 2015. Five Ukrainian soldiers have been killed and 26 wounded in fighting in the past 24 hours, spokesman Volodymyr Polyovy told a briefing in Kiev. The center of the main regional city of Donetsk echoed on Saturday with the sound of artillery blasts coming from the north and east. "The situation inside the city is tense and we can hear powerful artillery fire … but we have no immediate information about casualties and damages," an official of the rebel-controlled city administration said by phone. Separatist gains against Kiev government forces in eastern Ukraine, particularly a rebel advance on Debaltseve to the northeast of Donetsk, have given impetus to a Franco-German initiative to try to end the Ukrainian crisis. German Chancellor Angela Merkel, who with French President Francois Hollande met Russia's Vladimir Putin in the Kremlin on Friday, said in Munich on Saturday that there was no guarantee that the peace initiative would work. But she voiced opposition to the West supplying arms to the Ukrainian government to help them to defend themselves against separatists who Kiev says are supported by Russian arms and Russian troops - an opinion which has set her at odds with a strong body of opinion in the United States. Moscow, continues to lie, and says there is no proof of armed involvement by Russian forces. More than 5,350 civilians, Ukrainian soldiers and pro-separatist fighters have been killed since a separatist rebellion erupted in Ukraine's eastern territories in April. A peace deal was struck last September in Minsk, Belarus, but the agreed ceasefire was almost immediately violated and attempts to revive it have failed. Artillery and mortar fire on populated areas of the east including Donetsk itself have taken a toll on civilian lives, while more than 1,500 Ukrainian soldiers have been killed. The present focus on the battlefield is the town of Debaltseve, a vital rail and road junction which lies in a pocket between the two main separatist-controlled regions. Ukrainian government forces express confidence they have enough firepower to hold the town even though the rebels have steadily encroached in surrounding towns and villages. A Reuters correspondent who was in Debaltseve on Friday said Ukrainian forces kept up a steady barrage of mortar or howitzer fire from the town even as an operation to evacuate civilians was under way. Another source of concern for the Ukrainians is Mariupol, a southeastern city on the coast of the Sea of Azov, which lies between rebel-controlled areas and the Crimean peninsula, which was annexed by Russia last March. Mariupol's vulnerability was exposed last month when 30 civilians were killed there in intense rocket attacks. "The situation remains tense. The adversary is carrying out attacks across all the separation lines," military spokesman Polyovy said on Saturday. "The Russian terrorist forces are gathering strength for further offensives on Mariupol and Debaltseve. An increase in the number of tanks and armored vehicles in Debaltseve ... has been noticed," he said. In the village of Olenivka, about 15 km (9 miles) south from Donetsk, a rebel artillery unit was busy on Saturday digging trenches and doing weapons drill inside an abandoned farm. Inside the compound, a sole self-propelled howitzer was aimed at Ukrainian positions about four km to the west, its barrel shut with a protective cover. An anti tank gun was positioned nearby. The outer perimeter of the compound was blocked with anti-personnel mines masked with foliage. "We know the way in and out and whoever else steps in here will go with a big blast," said a rebel commander, who gave his nom de guerre, "the Priest". Reporters saw at least seven houses that had been damaged by shells. Valentyna Yefimova, 74, said a shell heavily damaged her home some days ago. "We were sitting inside when the shelling started … and then a shell landed on the corner of the house, but we were lucky as the blast threw the refrigerator onto us and it protected us from splinters," she said.